I'm having exactly same problem as fretz does. No matter what I do, the BombGrunt gets blown up on the last pyramid. Coincidence? And don't say it's a timing - it doesn't matter when I start the kamikaze run - when he hits the switch the amount of time needed for him to pass is always the same. Isn't that right? I just replayed the level. The improvements made it a bit better, good work. I have missed a coin somewhere though, dunno where. Also, it's a shame you couldn't use the excessive space a bit better, that unreachable part with a rolling ball and rockz confused me a bit. PS: Sheesh, alexandgruntz, give yourself a smaller avatar! You're breaking the forum! I have encountered that problem during my first try, during the next two approaches I somehow managed to avoid the problem. Duh. Fretz, you lucky ... right. The second run I made today ended up with my BomberGrunt getting blown up even one gray pyramid earlier that the day before! That just ain't fair. The spot my Grunt was starting the run from each time was a bridge, sticking out of a land. When I'd ordered my Grunt to start his kamikaze run from the GruntzCreationPoint, he ... succeeded on his first try, blowing up enemy SwordGruntz at the end of the passage. I just don't get it After that, getting Perfect score was not a problem. Alex, I know Zu has already given you enough of complaints about this CL ( all of which were unreasonable imho, but that doesn't really matter right now ), but you could give a little more spare time in this SilverPyramidz sequence, so that the BomberGrunt would always succeed at his run. Your reaction time seemz to be at least 200 millisecondz too slow. You must anticipate the clearing of the path to reach the first obstacle about 200 millisecondz after you start your kamikaze run. It really is just a matter of timing. I just came across this CL by chance. It is not in the list of CLs sorted by release date. How do I get information on newly released CLs? It appearz that this is one that "escaped between the crackz" ... or, in other wordz ... I blew it! For whatever reason, I did not add information for this CL in (most of) the indicez. So far, I have not found it in the alphabetical order index, or in the 2012 releasez ... and have not checked further as-of this post. I will correct this omission today, but I fear there may have been otherz released around the same time that also did not make it into the indicez. I will post again in this thread when I have updated the indicez and re-uploaded them to the web host for viewing. I have also begun the updating process for copyright notification on the web site, and will continue working on that today, as well as for this Forum. The timing of the release of this CL was such that I doubt there were any otherz missed ... there were a few releasez just dayz later. I completed all of AlexAndGruntz's maps but decided to share my thoughts only under one thread. 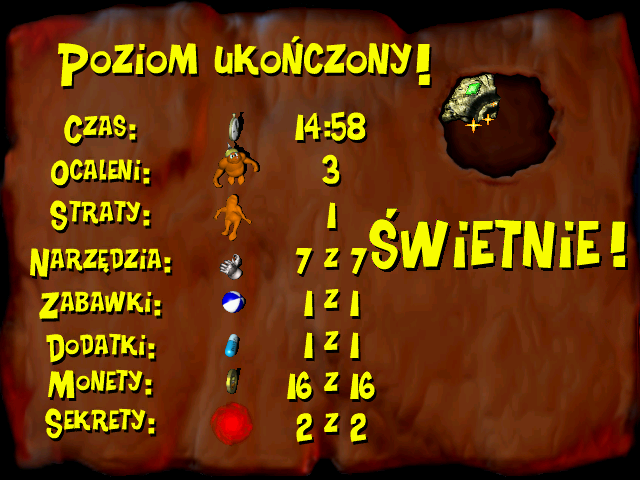 I saved a "Perfect" statz page for this specific level (14:58). There's a creative idea behind this one. You have a Grunt with nearly full health and the other two forced to stay at 1/20 health for the entire game, which means that they can't walk over spikes at all, so despite having multiple Gruntz, the solver doesn't have much of a choice where to send each one of them. The gameplay time is rather short but the puzzles are enjoyable. Of course there also are some questionable practices in it, like at least one troll bridge in the large tar pool and the tight timing of Silver Pyramids in the upper-right corner, which shows glitches in the game itself (depending on the computer, some players are not able to pass it). But in general, this designer always tried to create something original instead of repeating the "classical puzzles" all the time and deserves additional credit for it. He discovered some interactions around ToyBoxes, which later got used in his level to stop a diagonally-running bomb. One level was based on multiple Question Mark Switches which had a more complex purpose than just unlocking coins. He also modified the tile attributes a couple of times, to create secret passages for example (not always in a fair way unfortunately).